We are sure that everyone in Leabank Square is very proud of George for doing his sponsored 25 (!) laps of our green!!!! George - you are an absolute inspiration to the rest of us - and we can all support your fundraising efforts by donating any spare change we might have for your Haiti run. 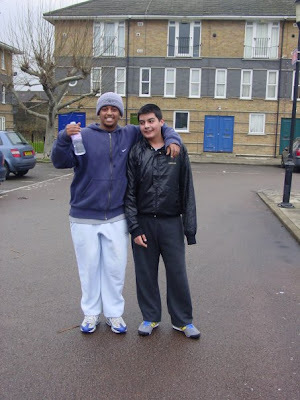 You can still donate to by visiting http://www.facebook.com/event.php?eid=285894195931 - but please thank George by leaving a message as well!! We started gardening in the Square because we felt that our communal spaces were being neglected and unloved. Neighbours told us about how magical the Square looked 20 years ago. They spoke about landscaped gardens with palms and a pond, as well as stunning wooden planters! We began to wonder why things had changed so drastically? Our gardening journey began by planting a few spring bulbs and their success was followed by the stunning wildflower meadow of summer 2008 and the edible garden of summer 2009. 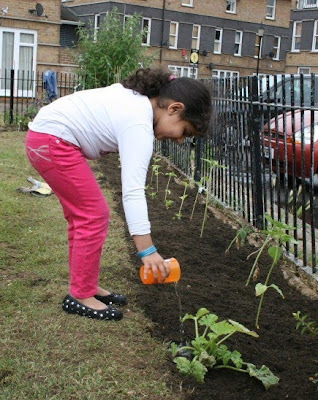 The overwhelmingly positive response we received was really encouraging and lots of children asked to be involved too, especially in the planting and watering! Gardening within these parameters has resulted in a highly creative, organic, community spirited, unique garden and riverbank. We have all made a positive contribution towards the way the Square looks. The Gardening club is supported by LSCA and PMMS. We have acquired permission to garden on the green and on the riverbank for the next 10 years. We are all volunteers (this means none of us gets paid) and we all garden because we think growing plants helps to make our Square look more attractive. Plus it has the added benefits of creating a bio-diverse environment for birds and insects as well as getting us all chatting to each other. If you would like to help out with the gardening or make a useful suggestion then please email us at leabanksquare@london.com. We would love to hear your ideas and appreciate any help you can offer. Gardening doesn’t always require ‘green fingers’. There are many ways you can help out. In the past neighbours have donated things like, their time, cash, skills, tools, pots, plants, bulbs and even a small greenhouse! The gardening club meets on the first Sunday of each month at 11am on the green. We do not meet in January or February, besides it being too cold, the gardeners are also having a well deserved rest! Details and information on the days’ activities are emailed out beforehand. Everyone is welcome. Please feel free to come and have a chat or simply join in. The most important factor in gardening has to be the volunteers. Without them, no amount of funding would mean a thing. It’s the wonderful neighbours in our Square who have generously donated their time and energy to clean, plant, water and care for our Square, who have ultimately made the difference. The volunteers have had to contend with many obstacles, including, inconsiderate behaviour such as dog fouling, littering, theft of tools and even vandalism of plants and produce. We would like to take this opportunity to say how proud we are of what the volunteers have achieved so far. We have worked so hard to create these garden spaces. Imagine what could be achieved with more neighbours joining in or supporting us in whatever way they can! If we could give a gold star to the most enthusiastic volunteer of the year, it would go to Z. Z, you have been fantastic, helping us collect compost, planting, problem-solving as well as always being ready to lend a hand. We appreciate your efforts and look forward to another productive and fun-filled year with you and all the others in the gardens! A big heart-felt thank you must also go to Tom Colbert, who has consistently supported our efforts by leaving wonderful gifts of plants and containers whenever he can. Tom, you have been a very humble and quiet supporter but your generosity and thoughtfulness have always been appreciated. Also, who can forget how stunning Lucy’s garden space looked last summer? Collette, Lucy and Amy were further responsible for the beautiful flower display in the container near the recycling bins. All of a sudden, recycling in the square became a really pleasant experience! The sunflowers made a stunning display last summer. They were chosen for several invaluable reasons. Firstly they are cheap and easy to grow from seed (helps when you have little or no funds!) They are very well-known for their soil cleansing properties, as well as essential in providing pollen for bees and seeds for our garden birds. One of the creative highlights of the sunflowers was when one was used to do a bit of sunflower art. If you missed it, you can still check it out at leabanksquare.blogspot.com. A big thank you to all the amazing neighbours who were involved in the Sunflower Project. Your time, energy and enthusiasm meant we had one of the best looking estates in Hackney Wick last summer! Thank you also to the volunteers who came out to take the sunflowers down in October, that’s Matthew, Anna, Z, Tony, Sóna, Nadira, Shanthi, Safiri, Paul and Cyprus. We all agreed on that day on how empty the Square looked without the sunflowers, so the gardeners also planted in a few daffodil bulbs. Those of you with a sharp eye would have noticed that some of these spring bulbs have already started to come up! A splash of spring colour will truly help to brighten up these grey winter days. The riverbank garden is a ‘recycled garden’. From planted handbags, palette compost bins, wooden cable reel tables, coppiced logs, recycled locker planters and painted baskets – we have worked extremely hard to create an environment that is highly resourceful and encourages wildlife, as well as being another cultivation space for our Square. Part of the riverbank has also become Leabank Square’s plant nursery – the place where all our seedlings grow big and strong before they are planted out into the Square. We have had many positive comments about our efforts in creating a sustainable and nature friendly community space, including encouraging words from RSPB London! Another exciting thing happened last summer, when we were included in an Olympic tour. It felt like we were a unique tourist attraction, especially when the tour guide asked her group to stop and take a look at the famous Leabank Square Riverbank! For now, the riverbank garden remains locked as many residents are still concerned about the health and safety issues of children playing near the canal. If you are interested in viewing the recycled garden, drop us an email at leabanksquare@london.com and we’ll arrange a guided tour! If you would like your own key to the gate, we can forward you the terms and conditions along with an application form. One of our star young gardeners last summer was Mohammed (http://leabanksquare.blogspot.com/2009/09/mohammeds-carrot-harvest.html), who grew the most fantastic carrots! The seeds came from the BBC’s ‘Dig In’ campaign, which was encouraging the nation to grow more vegetables. As you can see Mohammed did the gardeners proud! A Gold Star also goes to Aamna (http://leabanksquare.blogspot.com/2009/12/leabanksquareblogspotcom-wins.html) and her mum for all their efforts in watering the square last summer and their gallant attempts to grow corn! Gardening in the Square has encouraged a lot of wonderful wildlife to make Leabank Square its’ home! From dunnocks, finches, sparrows to even this little critter, which was discovered in our mini wildflower meadow. It is the common male grasshopper. (http://leabanksquare.blogspot.com/2009/10/bugs-of-leabank-square-grasshopper.html) If you discover any unusual bugs or birds please send us your pictures – we’d love to see them! Last spring/summer we grew tomatoes, squashes, corn, chives and beans on the green. In fact, as late as November, there were still a few tomatoes, mint and chives left to pick. However a lot of residents were put off harvesting this produce as dogs were still fouling on the green. Watering the gardens was also a big challenge over the summer. It took 3 hours to ensure the gardens were thoroughly watered on the hottest days and our improvised irrigation system didn’t quite do the trick! So growing vegetables on the green was a learning experience but hopefully with the help of a few more volunteers and some funding we can overcome these hurdles next year. Just as the country of Norway offers the City of London a Spruce each year for Christmas – the ODA has offered Leabank Square a living 6ft Norway Spruce! They will be helping to plant it in the gated garden in January. The Gardening Club and LSCA will be conducting a survey in the Spring, about the gardens and the riverbank. We would love to hear your opinions on the way the gardens are shaping up. What would you like to see in the gardens should we be successful in securing some funding? First club meet of the year. We will be looking to tidy up the wildflower meadow, removing weeds, dead plants and planning the growing season. 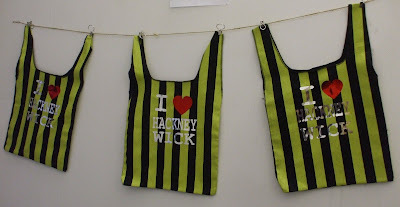 The first Hackney Wick Area Action Plan consultation is set for this coming Thursday 14th January between 6pm & 8pm - at the Hackney Wick Community Centre. This is when we all get to comment on the Hackney Wick Masterplan. There are 3 separate proposals for improving this part of Hackney Wick. This means that Hackney Council are thinking of re-organising the lay-out of the streets, parks, tow-paths & sidewalks - in order to make all our lives a whole heap better. Please - Leabank Square - we need to go down to the Hackney Wick Community Centre in order to comment and discuss all these changes. The two major changes that could happen here in Leabank Square are a foot-bridge over the canal into the Olympic Park through our square - and/or maybe opening up our Leabank Square Riverside Garden - including it in a tow-path on our side of the canal. These would have major effects on how we live our lives after the Olympics have gone. If you don't attend, you will be so disappointed if something changes & you said nothing! 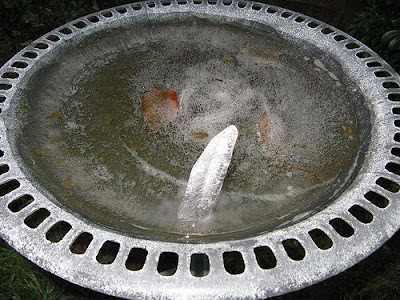 I know it seems like there is a lot of water around in this weather - but a lot of it is frozen. We have done loads over the last few years to encourage the birds back to Leabank Square. The bird boxes, hedges, berries, seed-balls, etc have all worked. 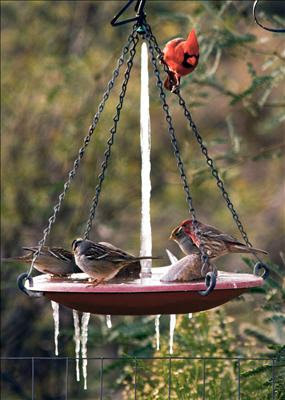 But please put some shallow bird baths out for them in these frozen temperatures as well. They are struggling to find water to drink because their normal ponds & puddles are frozen over. So please put out a shallow plate, or upturned lid, or bowl of water - out of reach of the cats of course - for them to get a drink. Please take care of yourselves in these sub zero temperatures! 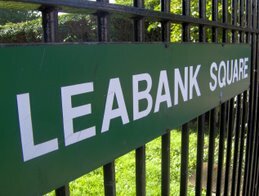 There are many unique things about Leabank Square, but the most important is that it is a private square. It does not belong to Hackney Council like every other estate neighbouring us. So you will see gritters, path clearer's & council cleaners making all the paths and roads safe for them. Whereas Leabank Square is left to it's own devices!! No one else is coming to shovel, grit and clean up around your front door and our ring road. We need to do it ourselves. So - if we all do the area outside our own doors - and a bit further - then we will have a safer & cleaner Leabank Square.